Despite an average childhood, Don always felt out of place, like he didn’t fit in. In high school, booze helped him feel more at ease. After his mom got sick, alcohol became a pain reliever. In 1969, Don entered the army and volunteered to go to Vietnam. He spent 10 months north of Saigon, drinking daily. Years of relentless, unending alcoholism followed. Florida, Michigan, Massachusetts and Chicago—always drinking—Don drifted through jobs like construction and bartending, paying the rent and getting drunk. He was married and divorced three times by 1999. “By the 90′s I knew that I needed to quit drinking”—so he tried heroin in 1996. His heroin addiction was ultimately worse than booze. Then came the long string of treatments—twelve in all. Year after year he entered hospitals and VA facilities, only to return again to drugs and alcohol upon discharge. Just before Thanksgiving in 2002, the VA referred Don to Dawn Farm. He entered our Detox to withdraw from heroin, then entered the Farm for a six month stay. After three months, Don had a revelation, standing in the snow outside the farmhouse. He said, “I¹m not gonna leave; I’m not gonna let things make me leave. I survived Vietnam, I can survive this.” It was his moment of surrender. Don graduated from treatment and, a year later, became a transitional House Manager. He worked with others to help them stay sober. Then tragedy struck. 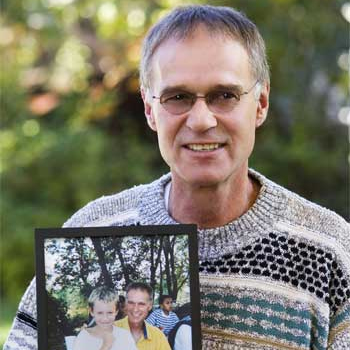 On a warm June day, Don learned that his son Nathan had leukemia. We watched Don apply spiritual principles over the next 13 months with dignity and courage as his son bravely fought cancer—and Don was there for him, every single day. One morning in July, Nathan succumbed to cancer at age 12. But Don did not succumb. Despite unthinkable grief, Don continued in recovery, continued to help others and move ahead. He has inspired us all.